Designed to monitor your heart rate, depending on your activity which may be workout periods, resting periods, etc. Designed to collect multiple Sports Data. You're able to track data from more than 14 sports modes which include Yoga, swimming, tennis, football, dancing etc. Designed to be a touchscreen for easy manipulations. A clear screen protector has been provided which also complements its brightness, clear vision even under the sunlight. Designed for you to choose your display Time Mode from four available options as well as your colour band as it may fit your outfit or style. Designed for most smartphones as its compatible with both Android (4.4 and above) as well as IOS (7.1 and above). Designed to be Comfortable and Easy to use.Most of your daily activities can be carried out with your smart bracelet worn.It could also be worn while asleep. For ease, download the 'VeryFitPro'APP. 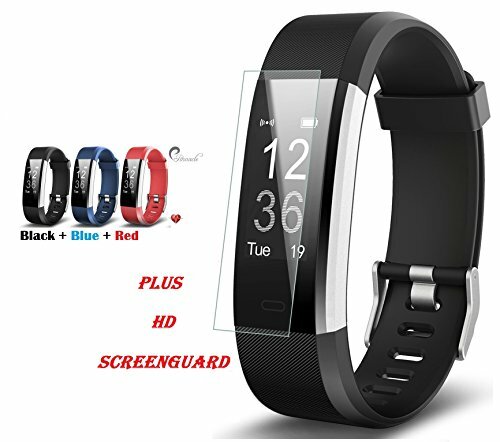 Function:Pedometer,distance /GPS monitor,calorie monitor,sleep monitor,multiple sports modes,alarm clock,remote camera control,sedentary alert,in-coming call alert,heart rate monitor. TAKE CHARGE OF YOUR HEALTH with P-Pinnacle activity bracelet: P-Pinnacle activity Fitness tracker is designed to monitor your heart rate (averagely 60 beats per mins) which changes depending on your activities. Its quality and accuracy makes it possible to track data from your steps, your sleep, GPS, your calorie consumption as well as sport activities (yoga, swimming, tennis, football, dancing, etc) in more than 14 Modes.  FEEL THE COMFORT FROM ITS LIGHT WEIGHT: This device comes with very comfortable anti-lost straps, hence can be worn all day and all night. It is also designed to be IP67 water-resist, which means you don't have to worry if it gets wet in a water bath, under the rain or in a pool etc.It is made out of a flexible, elastic, slim and durable silicon material. The package also comes with a protective screen guard which protects the touch screen from getting scratches. EXPERIENCE TOTAL CUSTOMER SERVICE AND WARRANTY: Our 24/7 customer service at P-Pinnacle will amaze you. We guarantee you a 100%, 30-Day money back guarantee and proper technical support if any problems come up. We promise to keep in touch after purchase. P-Pinnacle, your worthy route to the pinnacle!! BE FASHION CREATIVE with three different colors of bracelet straps. P-Pinnacle activity bracelet comes with a black strap, however, you could switch straps to two other colors as may fit your outfit or sport wear. It comes with four(4) different screen faces which are customizable for you to choose from as it may suit your color and style. The P-Pinnacle smart bracelet come with a USB built - in piece use for charging. Just connect it to any USB port or adapter, e.g your PC, or power bank etc. If you have any questions about this product by P-Pinnacle, contact us by completing and submitting the form below. If you are looking for a specif part number, please include it with your message.